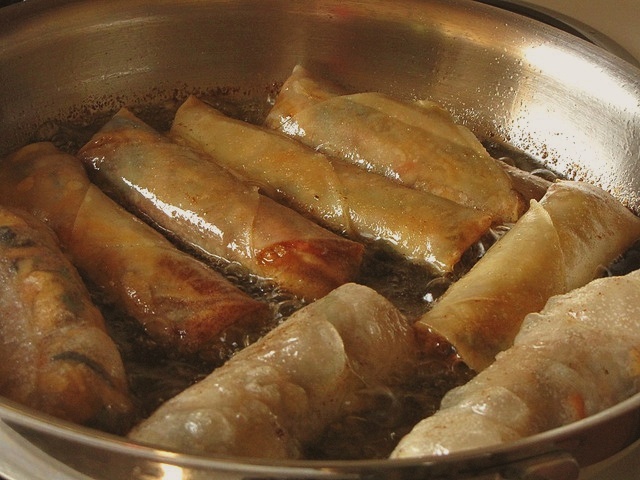 Traditionally spring rolls were prepared to celebrate the spring harvest and were, accordingly, packed with vegetables. Spring roll wrappers are available in Asian markets. In a bowl, whisk together vinegar and soy sauce. Stir in root ginger and let stand for 1-2 hours so flavour mingle. Heat oil in a wok and stir-fry all vegetables for about 2 minutes. Add salt, sugar and pepper. Stir-fry for 1-2 minutes until vegetables are tender but still retain some bite. Turn off heat and let vegetables cool. Place one wrapper on a flat surface and put roughly 2 spoonfuls of mixture down one side, about 5 cm from edge. Pull that edge over filling, tuck in ends and roll wrapper into a tight log. Seal edges with a little water or mixture of cornflour and water. Keep finished rolls under damp cloth or clingfilm to prevent them from drying out. Heat enough oil in a wok for deep frying. Fry rolls in batches for 2-3 minutes, until crispy and golden, then drain on kitchen towel. Serve hot with dipping sauce. My family members love spring rolls. I have tried few recipes but this is quite different from them. Thanks, I can try this as well.